In official statements and media commentaries, China keeps making the case against THAAD. North Korea conducted a rocket launch on February 7, a day before the beginning of the February 8-25 timeframe it had originally provided for the launch. With diplomats from around the world scrambling to come up with a unified response, South Korea and the United States have already decided on one bilateral move: formally beginning talks over the deployment of the U.S. Terminal High Altitude Area Defense (THAAD) system. That, in turn, has reignited hand wringing in China about the threat THAAD poses to Chinese national security. In fact, official statements from the Chinese Foreign Ministry on THAAD deployment were more severe than its statements responding to the North Korean launch. Spokesperson Hua Chunying said China had “noted” and “regrets” the launch; meanwhile, in a separate statement, Hua said China was “deeply concerned” about the start of THAAD talks. Deploying THAAD in South Korea “will not help maintain regional peace and stability, nor will it lead to a proper settlement of the current situation,” Hua cautioned. As a sign of China’s concern, Vice Foreign Minister Liu Zhenmin lodged representations over the issue with South Korea’s ambassador to China, Kim Jang-soo. Liu also summoned North Korea’s ambassador to lodge China’s protest over the rocket launch, implying once again that China sees THAAD as at least as threatening to Beijing’s interests as North Korea’s actions. “The likely THAAD deployment… is detrimental to the efforts to solve the nuclear issue on the Korean Peninsula as it is likely to trigger an arms race in the troubled region,” authors Hu Yao and Zhong Cuihua argue. Global Times offered a similar argument in its piece on the THAAD talks, saying the announcement “further complicates” the security situation in Northeast Asia. The piece claims that “nearly all military experts” believe THAAD is aimed just as much at China as it is at North Korea, “and thereby constitutes a potential harm to China’s security” (the piece dismissed Seoul’s claims to the contrary as “wan”). Global Times argues that the current rush toward THAAD, sparked by North Korea’s long-range rocket test, lacks strategic foresight: Seoul is “taking an impetuous action for the sake of its own security, without thinking about what further strategic effects it will cause and what is means over the long term.” Like Xinhua (and China’s Foreign Ministry), Global Times argues that THAAD deployment would backfire by making the Korean Peninsula more unstable. 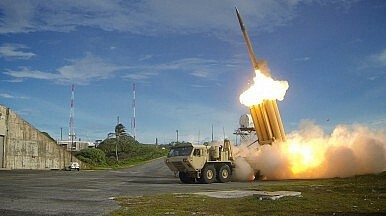 The article also warns that, if things on the Korean Peninsula do get out of hand, China will first be concerned with taking care of itself – by making “adequate military arrangement” to counter THAAD (Global Times suggests both increasing the number of Chinese missiles and improving their ability to evade defense systems). Meanwhile, China Youth Daily, in an article published before North Korea’s rocket launch, takes that logic a step farther. Author Li Dunqiu, a Korean studies scholar at Zhejiang University, argues that, by deploying THAAD on its soil, South Korea would be “hijacked” by the U.S. “rebalance to Asia” strategy. In other words, THAAD really benefits the United States, with Seoul acting as an unwitting pawn. Li begins by pointing out all South Korea stands to lose by deploying THAAD and angering China, noting that in the fourth quarter of 2015, South Korea passed Japan for the first time to become China’s second-largest trading partner. Li suggests, as Chinese scholars often do, that the Cold War-era alliance with the United States might no longer be in South Korea’s best interests. Li’s piece goes the farthest in arguing against THAAD; instead of dwelling on the threat to China (as Global Times did), Li wants to make the case against the missile defense system solely from South Korea’s perspective. But in the wake of another nuclear test and rocket launch by Pyongyang, Li’s argument that Seoul shouldn’t worry too much about Pyongayng — based on little more than quotes from North Korea media — isn’t likely to convince anyone responsible for South Korea’s defense. Meanwhile, none of the responses from China offer much in the way of constructive suggestions on how South Korea can ensure its own security without deploying THAAD – especially given that Beijing isn’t all that interested in punishing North Korea for its continued defiance of UN sanctions. Predictably, North Korea and THAAD dominated the discussion.